Staff and students at UTC South Durham are celebrating after it was recognised for its efforts in preparing young people for the world of work. 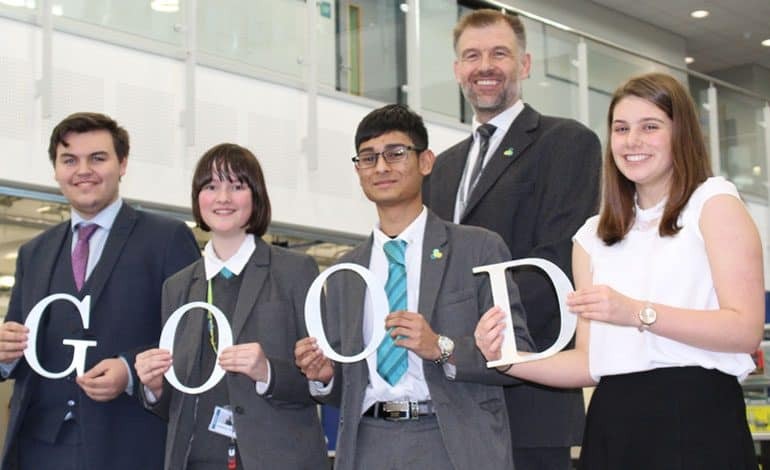 Ofsted inspectors were so impressed with the development of students that they awarded a ‘Good’ rating – a fantastic achievement for a school and Sixth Form only in its third year. The employability skills of the students have already been recognised by local businesses with all students leaving in Year 11 or 13 progressing on to either higher or further education, training, apprenticeships or employment. Just over half of the 18-year-old students went to meaningful paid apprenticeships with local employers – more than seven times the national average. The school and Sixth Form which specialises in engineering, technology and sciences for students aged 14-19, was praised by her majesty’s inspectors for improving the quality of education and raising students’ aspirations. Ofsted announced last month that there will be a future rebalancing of the inspection process with a greater focus on students’ curriculum, behaviour and personal development, something South Durham UTC has focused on from the start. Principal Tom Dower said: “We are all delighted with the outcome of our first Ofsted inspection. “We exist to help students make up their minds about what they want to do in the future by offering them exposure to variety of different careers. “To establish the first UTC in the North East is a real privilege but to be able to lead a team that teach the next generation of business leaders is truly inspiring. “In their time at UTC we equip our students with the workplace and industry skills required to futureproof their careers. “We are told by companies that our students are innovative, professional and technical in their approach and that the UTC difference makes them employable. The education watchdog examined five key areas, which have all been judged as good: effectiveness of leadership and management; quality of teaching, learning and assessment; personal development, behaviour and welfare; outcomes for students and 16 to 19 study programmes. Feedback from parents was outstanding. In Ofsted’s standard survey, Parent View, there were 94 responses (which is six times more than the national average); UTC parents really care about the education their children are getting. Almost all of them would recommend the UTC to other parents, 98% said that their child is happy and 100% said that their child is well looked after at the UTC. UTC South Durham is a state-funded, purpose built technical school for 14-19 year olds, which opened on Aycliffe Business Park in September 2016 founded by regional employers, Hitachi Rail and Gestamp Tallent in collaboration with University of Sunderland.